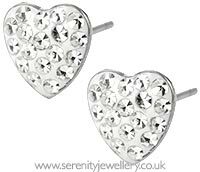 Hypoallergenic surgical steel 8mm multi-crystal heart stud earrings with surgical steel butterfly backs. The crystal are covered in clear resin to prevent them falling out. Amazing price for such good quality and pretty earrings. Very popular with teenage girls. 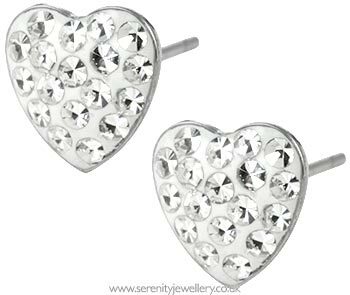 These stud earrings are very delicate and elegant. Brought for my 12 year old for school, bigger & prettier than basis studs but not too big for school. Look good & may treat myself to a pair too. Love these. Look v nice on and good value. Got these for my Daughter for Christmas and she was thrilled with them. They are a really good size, perfect for sensitive ears and so pretty. I would like a pair! Would buy again for presents. These are lovely. Have slept in them accidently as they are so comfortable to wear!